This article is about ground-based mass transit. For other cable railway systems, see Cable railway. For other uses, see Cable car. A cable car (usually known as a cable tram outside North America) is a type of cable railway used for mass transit where rail cars are hauled by a continuously moving cable running at a constant speed. Individual cars stop and start by releasing and gripping this cable as required. Cable cars are distinct from funiculars, where the cars are permanently attached to the cable, and cable railways, which are similar to funiculars, but where the rail vehicles are attached and detached manually. Cable Driving Plant, Designed and Constructed by Poole & Hunt, Baltimore, MD. Drawing by P.F. Goist, circa 1882. The powerhouse has two horizontal single-cylinder engines. The lithograph shows a hypothetical prototype of a cable powerhouse, rather than any actual built structure. Poole & Hunt, machinists and engineers, was a major cable industry designer and contractor and manufacturer of gearing, sheaves, shafting and wire rope drums. They did work for cable railways in Baltimore, Chicago, Hoboken, Kansas City, New York, and Philadelphia. The first cable-operated railway, employing a moving rope that could be picked up or released by a grip on the cars was the Fawdon Wagonway in 1826, a Colliery railway line. The London and Blackwall Railway, which opened for passengers in east London, England, in 1840 used such a system. The rope available at the time proved too susceptible to wear and the system was abandoned in favour of steam locomotives after eight years. In America, the first cable car installation in operation probably was the West Side and Yonkers Patent Railway in New York City, as its first-ever elevated railway which ran from 1 July 1868 to 1870. The cable technology used in this elevated railway involved collar-equipped cables and claw-equipped cars, proving cumbersome. The line was closed and rebuilt, reopening with steam locomotives. In 1869 P. G. T. Beauregard demonstrated a cable car at New Orleans and was issued U.S. Patent 97,343. 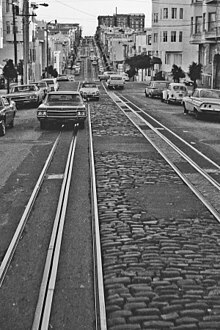 Other cable cars to use grips were those of the Clay Street Hill Railroad, which later became part of the San Francisco cable car system. The building of this line was promoted by Andrew Smith Hallidie with design work by William Eppelsheimer, and it was first tested in 1873. The success of these grips ensured that this line became the model for other cable car transit systems, and this model is often known as the Hallidie Cable Car. In 1881 the Dunedin cable tramway system opened in Dunedin, New Zealand and became the first such system outside San Francisco. For Dunedin, George Smith Duncan further developed the Hallidie model, introducing the pull curve and the slot brake; the former was a way to pull cars through a curve, since Dunedin's curves were too sharp to allow coasting, while the latter forced a wedge down into the cable slot to stop the car. Both of these innovations were generally adopted by other cities, including San Francisco. In Australia, the Melbourne cable tramway system operated from 1885 to 1940. It was one of the most extensive in the world with 1200 trams and trailers operating over 15 routes with 103 km (64 miles) of track. Sydney also had a couple of cable tram routes. Cable cars rapidly spread to other cities, although the major attraction for most was the ability to displace horsecar (or mule-drawn) systems rather than the ability to climb hills. Many people at the time viewed horse-drawn transit as unnecessarily cruel, and the fact that a typical horse could work only four or five hours per day necessitated the maintenance of large stables of draft animals that had to be fed, housed, groomed, medicated and rested. Thus, for a period, economics worked in favour of cable cars even in relatively flat cities. For example, the Chicago City Railway, also designed by Eppelsheimer, opened in Chicago in 1882 and went on to become the largest and most profitable cable car system. As with many cities, the problem in flat Chicago was not one of incline, but of transportation capacity. This caused a different approach to the combination of grip car and trailer. Rather than using a grip car and single trailer, as many cities did, or combining the grip and trailer into a single car, like San Francisco's California Cars, Chicago used grip cars to pull trains of up to three trailers. In 1883 the New York and Brooklyn Bridge Railway was opened, which had a most curious feature: though it was a cable car system, it used steam locomotives to get the cars into and out of the terminals. After 1896 the system was changed to one on which a motor car was added to each train to maneuver at the terminals, while en route, the trains were still propelled by the cable. A San Francisco cable car travels along California Street in the city's Financial District. On 25 September 1883, a test of a cable car system was held by Liverpool United Tramways and Omnibus Company in Kirkdale, Liverpool. This would have been the first cable car system in Europe, but the company decided against implementing it. Instead, the distinction went to the 1884 route from Archway to Highgate, north London, which used a continuous cable and grip system on the 1 in 11 (9%) climb of Highgate Hill. The installation was not reliable and was replaced by electric traction in 1909. Other cable car systems were implemented in Europe, though, among which was the Glasgow District Subway, the first underground cable car system, in 1896. (London, England's first deep-level tube railway, the City & South London Railway, had earlier also been built for cable haulage but had been converted to electric traction before opening in 1890.) A few more cable car systems were built in the United Kingdom, Portugal, and France. European cities, having many more curves in their streets, were ultimately less suitable for cable cars than American cities. Though some new cable car systems were still being built, by 1890 the cheaper to construct and simpler to operate electrically-powered trolley or tram started to become the norm, and eventually started to replace existing cable car systems. For a while hybrid cable/electric systems operated, for example in Chicago where electric cars had to be pulled by grip cars through the loop area, due to the lack of trolley wires there. Eventually, San Francisco became the only street-running manually operated system to survive—Dunedin, the second city with such cars, was also the second-last city to operate them, closing down in 1957. In the last decades of the 20th-century, cable traction in general has seen a limited revival as automatic people movers, used in resort areas, airports (for example, Toronto Airport), huge hospital centers and some urban settings. While many of these systems involve cars permanently attached to the cable, the Minimetro system from Poma/Leitner Group and the Cable Liner system from DCC Doppelmayr Cable Car both have variants that allow the cars to be automatically decoupled from the cable under computer control, and can thus be considered a modern interpretation of the cable car. The cable slot lies between the two tracks of the railway, providing an ingress for the grip, 1970. The cable is itself powered by a stationary motor or engine situated in a cable house or power house. The speed at which it moves is relatively constant depending on the number of units gripping the cable at any given time. The cable car begins moving when a clamping device attached to the car, called a grip, applies pressure to ("grips") the moving cable. Conversely, the car is stopped by releasing pressure on the cable (with or without completely detaching) and applying the brakes. This gripping and releasing action may be manual, as was the case in all early cable car systems, or automatic, as is the case in some recent cable operated people mover type systems. Gripping must be an even and gradual process in order to avoid bringing the car to cable speed too quickly and unacceptably jarring the passengers. In the case of manual systems, the grip resembles a very large pair of pliers, and considerable strength and skill are required to operate the car. As many early cable car operators discovered the hard way, if the grip is not applied properly, it can damage the cable, or even worse, become entangled in the cable. In the latter case, the cable car may not be able to stop and can wreak havoc along its route until the cable house realizes the mishap and halts the cable. One apparent advantage of the cable car is its relative energy efficiency. This is due to the economy of centrally located power stations, and the ability of descending cars to transfer energy to ascending cars. However, this advantage is totally negated by the relatively large energy consumption required to simply move the cable over and under the numerous guide rollers and around the many sheaves. Approximately 95% of the tractive effort in the San Francisco system is expended in simply moving the four cables at 9.5 miles per hour. Electric cars with regenerative braking do offer the advantages, without the problem of moving a cable. In the case of steep grades, however, cable traction has the major advantage of not depending on adhesion between wheels and rails. There is also the obvious advantage that keeping the car gripped to the cable will also limit the downhill speed to that of the cable. Because of the constant and relatively low speed, a cable car's potential to cause harm in an accident can be underestimated. Even with a cable car traveling at only 9 miles per hour, the mass of the cable car and the combined strength and speed of the cable can do quite a lot of damage in a collision. The Great Orme Tramway in Llandudno, Wales. Several street funiculars in Lisbon, Portugal. Even more confusingly, a hybrid cable car/funicular line once existed in the form of the original Wellington Cable Car, in the New Zealand city of Wellington. This line had both a continuous loop haulage cable that the cars gripped using a cable car gripper, and a balance cable permanently attached to both cars over an undriven pulley at the top of the line. The descending car gripped the haulage cable and was pulled downhill, in turn pulling the ascending car (which remained ungripped) uphill by the balance cable. This line was rebuilt in 1979 and is now a standard funicular, although it retains its old cable car name. The best known existing cable car system is the San Francisco cable car system in the city of San Francisco, California. San Francisco's cable cars constitute the oldest and largest such system in permanent operation, and it is the only one to still operate in the traditional manner with manually operated cars running in street traffic. Several cities operate a modern version of the cable car system. These systems are fully automated and run on their own reserved right of way. They are commonly referred to as people movers, although that term is also applied to systems with other forms of propulsion, including funicular style cable propulsion. Milan, Italy – People mover connecting the San Raffaele Hospital with Cascina Gobba station on the Milan Metro. Venice, Italy – The Venice People Mover connecting the Isola del Tronchetto with Piazzale Roma. A Seattle cable car in 1940, just before service ended. Seattle was the last city in the U.S. to abandon all its street cable railways, with the last three lines all closing in 1940, leaving San Francisco as the only U.S. city where cable cars continued to operate. ^ Hilton, George W. (1971). The Cable Car in America. Berkeley, CA. : Howell NorthBooks. ^ Erskine Hazard, Observations upon Rail-roads, The Franklin Journal and American Mechanics' Magazine, Vol. III, No. 4 (April 1827); page 275. ^ Fawdon Wagonway, Structural Images of the North East Archived 2012-09-02 at the Wayback Machine, University of Newcastle upon Tyne, 26 Mar. 2004. ^ Robertson, Andrew (March 1848). "Blackwall Railway Machinery". The Civil engineer and architect's journal. New York: Wiley & Putnam. 11. ^ James Guilbeau (2011). 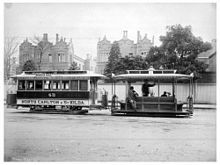 St. Charles Streetcar, The: Or, the New Orleans & Carrollton Railroad. Pelican Publishing Company. pp. 48–49. ISBN 9781879714021. ^ Louis C. Hennick; Elbridge Harper Charlton (1965). The Streetcars of New Orleans. Pelican Publishing. p. 16. ISBN 9781455612598. ^ "St. Charles Avenue Streetcar Line, 1835". Archived from the original on 2016-12-20. Retrieved 2016-03-29. ^ Taylor, Sheila (2001). The Moving Metropolis. London: Calmann and King. p. 82. ISBN 1-85669-241-8. ^ "POMA" (in French). Transports Urbain Laonnois. Retrieved 2009-04-02. ^ "Doppelmayr Cable Car". Doppelmayr. Retrieved 2009-10-22. ^ Hilton (1982), p. 167. ^ Hilton (1982), pp. 389–407. ^ Hilton (1982), p. 465. Hilton, George W. (1982). The Cable Car in America (Revised Edition). San Diego, California: Howell–North Books. Reprinted 1997 by Stanford University Press. ISBN 0-8047-3051-2. Of Cables and Grips: The Cable Cars of San Francisco, by Robert Callwell and Walter Rice, published by Friends of the Cable Car Museum, first edition, 2000. 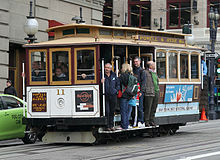 Wikimedia Commons has media related to Cable car on rails. Wikimedia Commons has media related to Cable cars (railway). Wikisource has the text of The New Student's Reference Work article "Cable-Road". The Cable Building (New York City) Broadway Cable car line.